I think I’m in love. With a cookie. It may not be the most handsome cookie around, but the taste makes up for what it’s lacking in looks. Imagine: chewy on the inside, crispy on the outside, and a rich and caramely flavor in every bite. My coworkers are going to love me (and their sugar high) tomorrow. Perhaps someone well versed in the science of baking can tell me what the browned butter does to the cookie. Aside from the obvious, adding amazing flavor. And also, why is the salt added with the brown sugar rather than with the rest of the dry ingredients? Just a note: My butter took around six minutes to brown, so don’t worry if three minutes go by and you’re wondering if you screwed up; you didn’t. Heat 10 tablespoons of the butter in a pan over medium-high heat until melted. Continue to cook the butter until it is browned a dark golden color and smells nutty, about 1 to 3 minutes. Transfer the browned butter to a bowl and stir the rest of the butter into the hot butter until it melts- let this rest for 15 min. Preheat oven to 350 degrees F. In a baking dish, mix granulated sugar and a ¼ cup of the brown sugar until combined well; set this mixture aside to roll dough balls in. Mix flour, baking soda, and baking powder in a bowl. Add 1 ¾ cup brown sugar and salt to cooled butter and mix until there are no lumps. Add egg, yolk, and vanilla to butter mixture and mix well, then add flour and mix until just combined. Roll dough into balls about 1 ½ inches in diameter, and roll balls in brown sugar and white sugar mixture. Place balls about 2 inches apart on parchment lined baking sheets. Bake sheets one at a time until cookies are puffy and lightly browned, about 12- 14 minutes. (It says the cookies will look slightly raw between some of the cracks and seem underdone, but be careful not to over bake.) Cool on sheet for about 5 minutes and then transfer to a rack to cool. Recipe from Cook’s Illustrated via South in Your Mouth. The molasses in brown sugar makes it very hygroscopic, meaning it attracts water molecules well. Hence the chewiness of things baked with brown sugar. I don’t know of any reason why the salt would be added to the sugar instead of to the dry ingredients as a whole. I would love to know if there is a reason for it! I was talking about brown sugar, oops! As for browned butter, it has undergone Maillard reactions, which is the browning of sugars and proteins (sometimes known when they are bonded as glycoproteins). Maillard reactions are responsible for the tastiness of browned meat, browned butter, etc. Caramelization only occurs in sugars. If you hadn’t had browned the butter previously, the Maillard reaction would have been much less a part of the cookie. So, in essence, I would say you’re right. The browned butter just adds flavor. I made them as soon as I could! Those look great! I’ll have to make them once all of my cupcakes are gone! So simple and so delicious! Browned butter makes the world a better place. That’s a fact! i’m planning to make cookies tonight and i was trying to think of something to make along with my standby of chocolate chip oatmeal and i think this is perfect. What’s not to love? The best part is those ingredients are nearly always on hand – you know – for late night cookie emergencies. Let me know what you think of them after you bake! And Lisa, yes that is true, and dangerous! I made these last night and they are great! They are very rich though…I was wondering if perhaps next time I should add a little bit more salt to counteract all the butter/sugar richness? A nice cold glass of milk certainly did the trick last night though. I was thinking of sprinkling them with sea salt rather than rolling them in the sugar mixture. What do you think? Okay, well I’m glad I’m not the only one that loved these cookies!! So yummy and rich! Hilary, I twas thinking about that too. But I thought that might be too “out there” for my husband and co-workers, who were the recipients of these goodies. Maybe next time I’ll try a few with the salt and see what happens. Definitely sea salt, you are right…for the crunch factor. These are fabulous! I crushed up some artisan pyramid sea salt in my mortar and pistil and sprinkled it over the top… I think it was the perfect little punch. Your photos and recipes are amazing. Everybody in my house LOVED these cookies (including my little girls who usually prefer things with chocolate). My daughter said they are the best cookies I ever made! Thanks for the recipe. I will have to give them a 10. WOW I don’t think I have ever made a better cookie. I don’t even think I have ever had a better cookie. OMG the best awesome chewy crispy toffee like flavor. GREAT!! My whole family enjoyed them coming back for more saying OMG these are awesome.. Thank you for the recipe. I finally got to make these cookies and I tried to make a double batch as I always do and I forgot to double the eggs! Totally flat but very delicious. I did it again the following week the RIGHT way and they are awesome. Definitely watch out when cooking them as they will overcook in 30 seconds. I just made these cookies and the cookie dough turned out more like batter than dough. It’s a warm day, maybe should have let the butter get cooler after browning before proceeding. anyway they taste great, but very flat. i could not roll them in sugar, though. it was just too hard to work with, so i just spooned the batter on the sheet and baked at 365. Is there anything else i can do besides using parchment paper? This exact recipe was made today on PBS’s America’s Test Kitchen. It was determined by the baker and tester that these were the best tasting cookie ever! Their dough came out was firm enough to be manageable. Perhaps Jeff’s thinner batter may have been the results of using a larger sized egg? @Jeff – Perhaps you used larger sized eggs? This same recipe was demonstrated today on OPB – America’s Test Kitchen. Theirs came out as a manageable dough. i made these cookies. They are wonderful! But, they turned out soft and fluffy. I followed everything. they are not flat or crispy. What did i do wrong? Please help someone! I made these cookies and they didn’t look anything like the photo you have up. There were more cake like and fluffy. My husband and I were in dire need of satisfying our sweet tooth… these were so amazing! It wasn’t just a cookie but a gourmet delight! Thank you so very much!! just made them after i saw the recipe and had just enough butter to make them. 🙂 They turned out SO good. Mine were like the picture.. but the ‘dough’ was more like batter. I added a little more flour till it got thicker, then used rounded tablespoons and dropped in sugar mixture (because i still couldn’t roll it was too soft) Thanks! will definitely make again! Wow, these are incredible! Now I’m curious to find out what difference browning some of the butter in another cookie recipe would make. I wonder if the folks who are getting a batter instead of a dough are browning the butter long enough? I did mine the way I would to make ghee — you wait until just after it’s stopped bubbling when the solids start to brown. As I understand it, the bubbling is caused by the water in the butter boiling away into steam. On my stove that took about 10 minutes, especially since I was tentative with the heat. Maybe if you don’t boil the water out, you get a wetter batter? Or maybe it’s the weather or something. Anyway, I can’t wait to make these for the folks at home! i have been waiting for the right time and tonight was it. my son and i made these cookies and he declared them “the best cookies ever.” oh…and he’s 8 years old. i’m with all the people who thought a little salt on top would be rockin’ good….but the glass of milk was perfect with them. mm….i’m wondering if they’ll survive until tomorrow. i think i might eat them all before bed. This is in my top 5 cookies of all time. No one in my family can resist them, and always want the recipe. Each time I make them, however, the dough is a bit too wet. I’ve found that putting the final dough in the fridge for 30 minutes makes all the difference. Thank you so much for that awesome recipe! My wife made those cookies several times already and she just now needed the recipe again. I think I’ll be getting some cookies shortly. This recipe is so good! Browning the butter gives the cookies this amazing depth of flavor. I added some sliced almonds to a batch I made, and also a little almond extract, and that gave them a whole new twist. @Lisa – OMG! That is SOO True!! I’m having a late night cookie emergency RIGHT NOW and these are PERFECT. Made them and they are ABSOLUTELY DEE LISH!!! (and the dough is to die for as well! Was wishing I could drop dough balls into some vanilla ice cream!) hahha. Thank you for this recipe…it’s going in THE Files! Yum…Yum…Yum! This is a great recipe! I made the cookies tonight and they were a smash with my family….and the Browned butter makes even more fantastic! Hooray for Brown Sugar Cookies!!!! Just made these (subbing light brown for dark brown, because I didn’t have any dark brown) and they came out perfect! The brown butter gave it a nice toffee flavor that really surprised me when I tasted the dough. I measured the ingredients by weight and had no trouble, so the issues with wetness/fluffiness/cakiness might be artifacts of volumetric measurement. this recipe is from cooks illustrated. Jillian that is correct, and it says that in the post. I know I’m late to the party on these but DANG. My girlfriend in Texas posted the link to this recipe on her Facebook status with “Make these now” caption. She was right. These are silly. Thanks for the recipe!!!! Just made these. Hit the spot for sure! Hands down the easiest cookies I have made, browning butter included. I did not have parchment, used wax paper, worked fine…..
I’m going to make these this week. In a recipe I made recently, I rolled the dough in a mixture of granulated sugar and table salt (not kosher) before baking. The salty-sweet was AMAZING. I wonder if a little salt added to the granulated/brown sugar for rolling would work for these? May have to experiment! wow! just made these. they are seriously the best cookies i have ever made! 12 minutes and they were absolutely perfect! crispy and chewy at the same time. 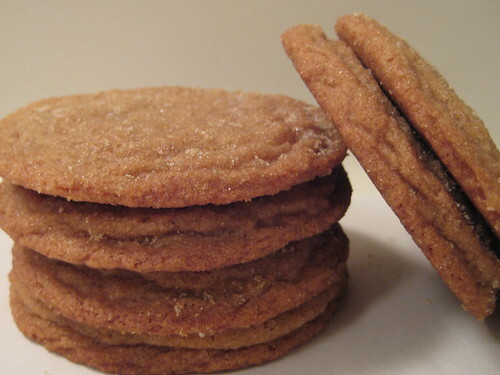 the hubster said they tasted like a “caramel cookie.” i would highly recommend this recipe. Made these twice in the last two weeks, and they were a HUGE hit. Dropped a few off with my sister-in-law, and her husband called as soon as he ate one to make sure that she got the recipe. Really amazing flavor and texture, I’ll definitely be making these many times in the future. I kept the cookies in the oven for exaclty 12 minutes and after they cooled the bottoms were crunchy and the insides nice and soft. Just wanted to make sure I didn’t overcook…are the bottoms supposed to be crunchy? I will be making these at least 3 more times this holiday season. Thanks for the recipe! I totally agree about falling in love. I am smitten! As are all my friends who tasted this cookie. We really love the sweet/salty combo so I added 1.5 tsp of coarse sea salt to the white/brown sugar mix that you roll the dough balls in. Yum! I loved these! My dough was very crumbly and I had to add milk. I refrigerated my melted butter for about 25 minutes, so it may have been due to the butter being too cool. Anyway, after a small sample batch, half salted and halt without salt, I decided to go on without the salt. I didn’t think it added much, and my boyfriend thought it took away from the sweetness. Either way, they’re really delicious. I’m bringing them to a party tonight and think they’ll be a hit. They were super easy too. Thanks! Wonderful recipe! I used a small melon baller to portion out, then cut those in half to make bite sized cookies. Perfect for showers or parties. I also added some cinnamon to the finishing sugars on half & that took some of the extreme sweetness away. I love them both ways! I have made these a bunch of times; however, the last two times I have made this recipe, the cookies have not come out flat. I used bleached flour instead of unbleached. Could this be the reason? Any advice would be appreciated. @Josh – Try flattening them a bit with the palm of your hand before baking them. Also, when there’s still a couple minutes left to bake, you can take a spatula and tap them to flatten them a bit. Let me know how those tips work out! Just made these tonight! Followed the recipe exactly and they turned out YUMMY! Tested one on my husband and he thought they were moist and yummy!. They were slightly crispy on the outside and slightly chewy on the inside. Just sprayed baking sheet with butter spray and they came off smoothly.Nicely paired with coffee or milk. Thanks for this!! They came out flat like pancakes but Ohhhh they are yummy! I’m pretty sure that vegetable spread won’t give the same nutty brown flavor as the browned butter, but if you just melted the same portion of margarine as butter the consistency of the recipe should be similar. It just won’t have quite the same flavor.